The world's first diving helmet is now on display at The Diving Museum in Hampshire, thanks to a GB£21,000 grant from the South East Museum Development Program. The Diving Museum is an outreach project of the UK Historical Diving Society, an all-volunteer registered charity. The Deane Helmet is on loan from the Science Museum of London for three years. It is the first time the helmet has been on display to the general public. 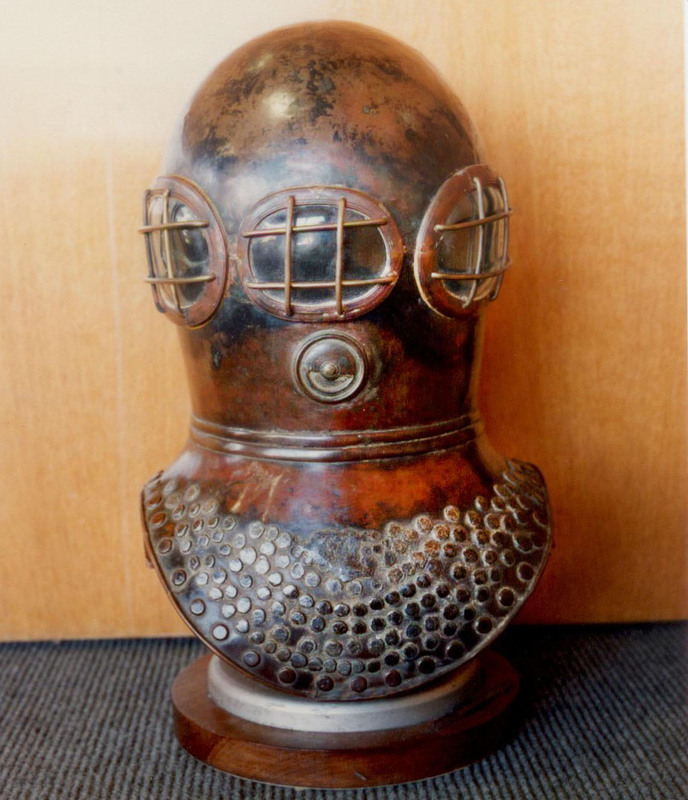 The Deane diving helmet was conceived in 1828. It is more than probable that the idea for this helmet came from a "smoke helmet." 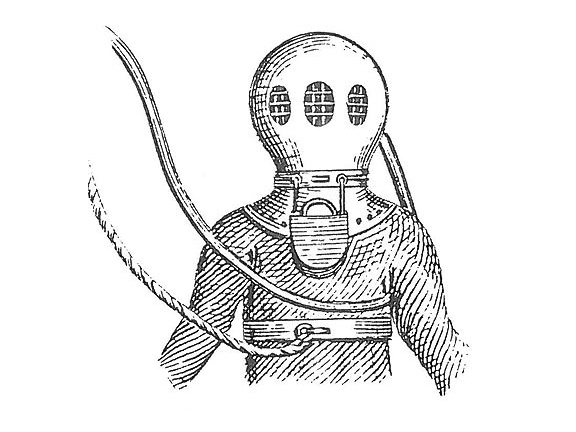 On 4 November 1823, Charles Deane filed a patent for "an apparatus or machine to be worn by persons entering rooms or other places filled with smoke or other vapor, for the purpose of extinguishing fire or extricating persons or property therein". The patent was number 4869. At the time, Deane was a caulker, a job that potentially involved fire because he was working with boiling pitch. It was a job that would also take him to sea. On 25 May 1818, Deane, along with his brother John, had joined HEIC Warren Hastings (Honorable East India Company) and sailed down the Thames. The destination was Madras. The ship's voyage finished on 1 July the following year when it "anchored below Gravesend". "It is most likely that during his sea-going career and whilst working in a ship-building yard he [Charles Deane] must have seen many a fire on board ship. He would have become acutely aware of the problem of dense smoke preventing escape and rescue," wrote John Bevan in 'The Infernal Diver'. Patent 4869 was not commercially successful; however, it was to prove a useful basis for John and Charles Deane's subsequent 'open diving helmet'. "Whitstable was the birthplace of the diver. The first man to go underwater in a diving dress was named John Deane. "Very curious and interesting is the story how he became a diver. About 1830 a fire occurred in a large farm. First haystacks caught fire and then one of the stables, where the best team of horses were put away for the night. Great efforts were made to extinguish the flames, but there was no fire engines in those days. Pails of water were used, and then an old pump, with a long pipe attached, which was placed in a large pond. This threw a small jet of water on the fire, but without much effect. Several attempts were made to get the horses out, but without success. "A large crowd assembled, among whom was John Deane, a powerfully built man, who quickly thought out a plan to save the horses. In the hall of the farmhouse stood an old suit of armour. Being a friend of the farmer, he asked if he might use the helmet and try and save the horses. Consent was readily given, and placing it over his head, he secured the pipe from the old pump to the inside and asked the farmer to pump air slowly. Then he walked into the stable through the dense smoke, and brought out one horse after another, until all were saved. "Everybody cheered and congratulated Deane on his bravery and success, but he had not yet finished with the old pump. He borrowed it and rigged up a ladder with a water right dress. The helmet had two large round pieces of glass to look through. On a calm day he tried it at high water along the seashore, but found when the water covered his head, the air pumped into his dress caused him to turn upside down. To alter this he made fast to his shoes some pieces of lead, which kept his feet down, and enabled him to walk underwater quite easily. "Later Deane went off with the sweepers (men who go sweeping for anchors and chains which are lost by ships). When they came fast to an anchor, he could go down in his diving dress, the men on the deck pumping air to him. He would then make fast a chain, and they would heave up the anchor. He then went out to a wreck and sent up several things that had lain there for years." "It was ultimately re-told to Goodsall who subsequently related it once more in his book published in 1938. The account was a product of 110 years of story-telling. It was inevitable that inaccuracies had crept in over the years." Whilst writing this article, I spoke to Bevan and asked him what he believed happened. Bevan thinks that the fire took place in a pub in Whitstable, rather than on a farm. The location is more in keeping for an "East India man". Whilst researching 'The Infernal Diver', Bevan followed John Deane's career. This included reading the crew lists of the ships on which Deane served. One particular crew list contained a number of surnames that were common in Whitstable, Kent, at the time. Bevan believes that when Deane was not working at sea, he stayed with friends and fellow sailors in and around Whitstable. Bevan therefore surmises that the location of the fire is the stables of the Bear & Key. This Whitstable coaching inn still has stables today. It also has a well, which would have provided water to quench a fire. And Bevan feels that a pub is more likely to have a suit of armor than a farm. Bevan also reports that there are several more reliable reports that the Deane diving dress was initially developed by experimenting in the Croydon Canal in 1828 near Charles Deane's home in Deptford. "On the positive side, the existence of a Deane helmet with only two glass windows in about 1830 is confirmed in a sketch by Simon Goodrich. In fact there are several references to one of the first Deane helmets having only two windows about this time." It should be noted that Bevan's theory about the stable fire should not be lightly dismissed. He is the foremost expert on the Deanes, and he wrote the definitive text on the brothers 'The Infernal Diver'. So how did the first diving helmet come about? We do know that the diving bell re-appeared in 1828 as a means of salvaging valuable cargo from wrecks. At the time, many large sailing vessels routinely anchored off the south coasts of Essex and Kent, including ships inbound to the Pool of London. It is not uncommon for vessels to either lose or slip their anchor. Sweepers—men who had developed highly successful salvage methods without diving—would search for and snag lost anchors. John Deane was in Whitstable at the time and possessed unique knowledge. He could see the limit of the diving bell; it was hard to operate and unwieldy. Bevan also reported that John Deane "was in a unique situation of personally experiencing the operation of a diving bell with its pump and air hose in one hand, and on the other, knowing of the existence of his brother's smoke helmet, also with its own pump and air hose. What could be more natural for John than to see the obvious new application of the smoke helmet?" The invention after a long series of experiments, vast study and labor, was brought to full perfection in 1828. The Deane brothers developed their revolutionary helmet diving dress, making it the very first helmet in the development of helmet diving. The Deane helmet is an 'open' helmet because it is open at the bottom, i.e. it is the equivalent of putting a bucket over your head. The diving dress came up inside the helmet and the water level kept down by the pressure of air being pumped down from the surface. The brothers carried out their first commercial dive in 1829, off the Isle of Wight. The Deane helmet is highly significant to Gosport, because in 1835, John Deane moved to Gosport where he lived until 1845. He dived on wrecks such as the Royal George (which sank in 1782 and resulted in the biggest loss of life in British waters), and in 1836, he discovered the Mary Rose. Henry Abbinett was a Gosport mariner who provided boat services for John Deane from 1832 and persuaded the Deane brothers to sell him a hat, making him the first man in the world to purchase a diving helmet. John and Henry became close friends and often worked together on salvage projects in Britain and around the world. Abbinett went on to become a career salvage diver. The helmet was then enthusiastically adopted by Colonel Charles Pasley of the Royal Engineers. Today, the British Army never fail to remind the Royal Navy that they were the second of the forces to dive.